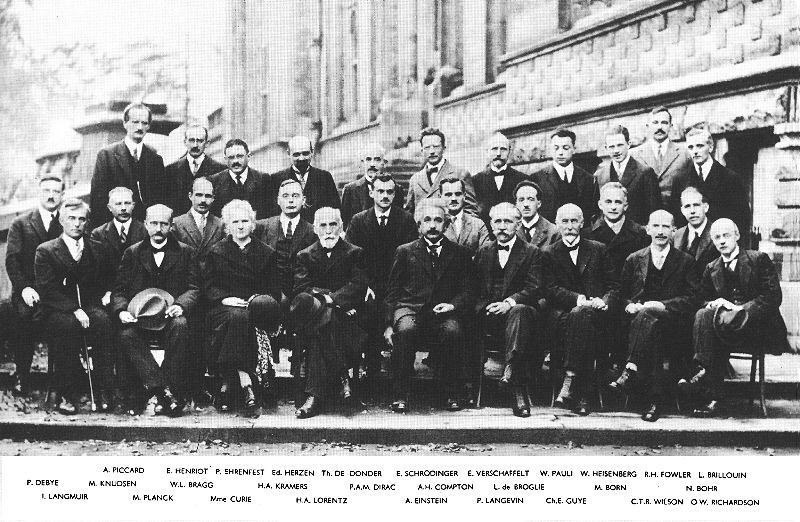 The latter half of the 20th century has witnessed the experimental verification of some of the mind-bending theories of the quantum mechanics. Among these, are the experimental demonstrations of the theory of quantum entanglement, a solid contender for this year's Nobel Prize. The concept of quantum entanglement, introduced in part by the Einstein-Podolsky-Rosen (EPR) thought experiment, describes a mysterious link between two particles, such as photons produced in an atomic decay, as they shoot off in different directions. Assuming nothing intervenes in the photon's path and regardless of the distance between the photons, these photons share a polarization (kind of like spatial orientation) that is a combination of any of their possible orientations. If a measurement is made on photon A, the act of taking that measurement causes photon A to assume definite value (say, vertical polarization) and its entangled partner, photon B, to take the opposite value (horizontal polarization). And, this is true regardless of the distance between the photons. This result of entanglement calls into question our classical understanding of "locality." Locality is the idea that you can directly affect only what is nearby and any indirect effect you have at a distance must propagate through a continuous chain of local events. The EPR experiment presents a discrepancy with this classical constraint of locality. The measurement of photon A as "vertical" collapses photon B into a definite horizontal polarization and we know this before anything could have traveled the distance to tell photon B what orientation to take. Experiments like this demonstrate that on the quantum scale, classical principles of locality don't apply! 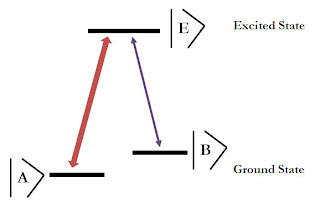 The first experimental observations of quantum nonlocality were those of Freedman and Clauser in 1972 and Alain Aspect's construction of an analog to the EPR thought experiment in 1982. These experiments, along with the dozens that followed, have paved the way for scientists to apply the mind-twisting capabilities of the quantum world to our day to day lives [see Quantum Information]. Media attention circulating the globe for the past year has made the Higgs boson, CERN and The Large Hadron Collider, and the universal questions of particle physics probably the most popular physics story of the past year. And rightly so as, in finding experimental evidence for the Higgs boson, the global collaboration of scientists and engineers made real what had before had only been predicted by the theoretical Standard Model of particle physics. If you missed the several thousand articles covering the Higgs, check out this informative video by the folks at PhDComics. 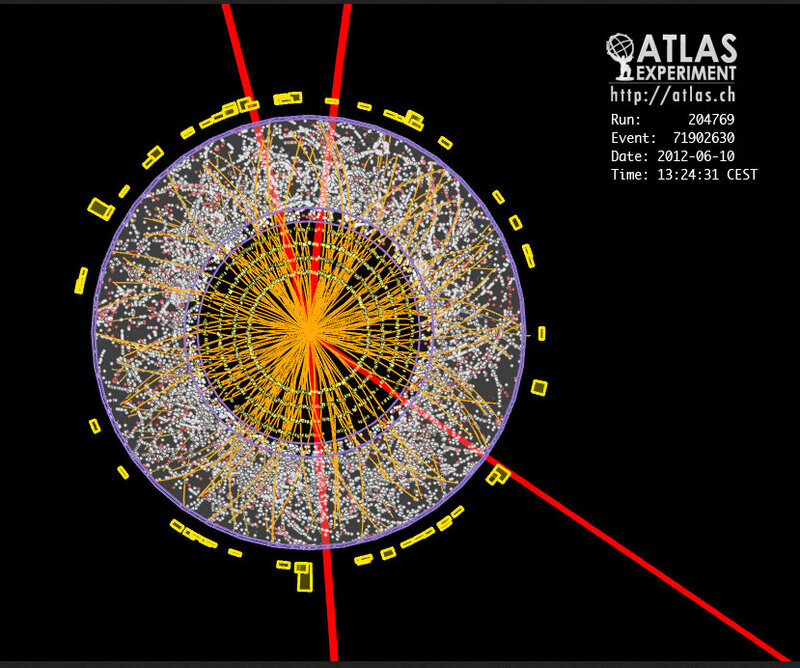 Image of an ATLAS collision that detected 4 muon tracks (red), thought to be the signature of the Higgs boson. Looking back at Alfred Nobel's request for the awards, there is good argument that the Higgs boson is a pretty good contender as an influential discovery that took place "during the previous year." But it turns out, only rarely does the Nobel committee select work done recently, preferring instead to recognize work whose impact has withstood the test of time. There is another interesting factor when weighing the Higgs boson for the prize; the statutes of the Nobel Foundation declare that the Nobel prize can't be divided among more than three people. Along with the discussion of the other theorists who proposed the Higg's, a nice article in Scientific American talks about how this restriction runs contradictory to the group collaborations necessary to how much of science is conducted today. Another contender for this year's Nobel are the physicists who became engineers of the entangled universe, applying quantum entanglement and nonlocality to designs of quantum computing, quantum cryptography, and quantum teleportation. One major outcome of the experimental verification of quantum entanglement and nonlocality is the application to quantum computing; information is stored by quantum-bits, or "qubits" with the states of the particle assigned to the traditional 0's and 1's of binary code. Once the states are translated into binary, quantum information can be processed similar to computers today. The benefit: quantum computers have the capacity to be faster, use less energy, and fit on a smaller chip than today's macro-computers. Since the eighties, physicists have been theorizing and then demonstrating the possibility of encoding secret messages through quantum cryptography. Rather than the jumble of symbols that come to mind when decoding secret messages, quantum cryptography hides the information in the the polarization of the photon. One of the major players of quantum cryptography, Gilles Brassard, has a nice commentary in Nature on quantum information and cryptography, and you can read Brassard and Charles Bennett's original proposal of quantum cryptography in 1984 here. The awesome process of quantum teleportation, first suggested by Brassard, Bennett, Wooters et. al. in 1993, is that the quantum state can be transported from one location to another without passing through the intervening space. Just this year, quantum teleportation made a huge leap when Anton Zeilinger teleported the quantum state of a photon 88.8 miles (143km) across the sea separating the Canary Islands. Shortlisted for this year's physics Nobel is a process that slows down light, making use of a special kind of matter and a technique that can make opaque materials suddenly transparent. Under the right fancy laser pattern called Electromagnetically Induced Transparency, Steve Harris and his lab demonstrated that otherwise opaque materials can become "transparent." Usually, when you shoot a laser through a material, some of the light is reflected, some is absorbed and some is transmitted. But, if you can get the material not to absorb the light, the light can move through the material as though it were transparent. This is the essence of electromagnetically induced transparency (EIT). 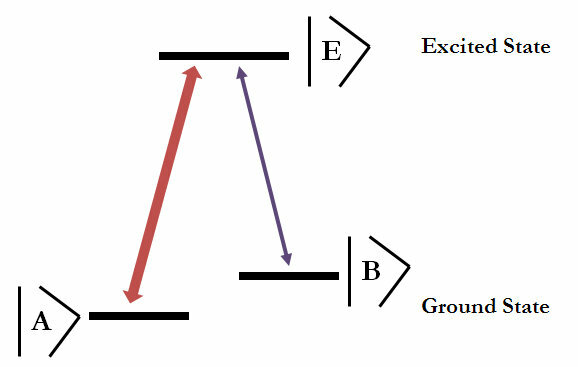 In order to change the way light propagates through a material, remember that in moving through the material, the light is actually exciting the atoms in the material from an energy ground state A into an energy excited state E. If we are using atoms with two ground states (such as alkali atoms) and now send in a second laser that is specially adjusted to the energy difference between the other energy ground state B and the excited state E, the combined effect of the two lasers is to provide two possible pathways for light to excite the atoms (A-->E or B-->E). Each atom in the material has two ground state levels A and B.
can interfere and cancel out. As it turns out, these two excitation pathways can cancel each other out! When they do, none of the atoms are excited by the incoming laser. Without light absorption by the atoms, the laser can move through the material as though it were transparent. Really cool. The second ingredient in slow light is a new state of matter, called the Bose-Einstein Condensate. In 2001, Eric Cornell, Wolfgang Ketterle, and Carl Wieman won the Nobel Prize in physics for experimentally creating the bose-einstein condensate state of matter. In ultra-cold temperatures a billionth of a degree above absolute zero with a super-high vacuum seal, Bose-Einstein condensates form when atoms are surrounded by lasers that trap the atoms, slowing and cooling them and a magnetic field that whisks away all but the slowest, coolest, lowest energy atoms. Laser and magnetic field trap cools atoms to their condensate form. In these extreme conditions, a gas of atoms can suddenly gather together and drop into the atoms' lowest possible energy state. 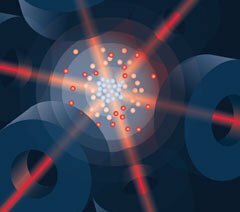 This "condensation" makes a really weird material in which the millions of atoms in a gas come together to become completely identical to one another and act almost like one "super atom"-- with the power to slow down light. So it's no surprise that the scientists who discovered that Bose-Einstein condensates paired with electromagnetically induced transparency can slow down light are up for the Nobel. While the electromagnetically induced transparency allows the light to move through the dense bose-einstein condensate without reflection or refraction, the high density of atoms in the condensate compresses the light, keeping it very, very slow. In 1999, Lene Hau slowed the light down to just 17 meters per second-- about 38 mph. Since then, scientists have discovered many other ways to slow light down and have just started thinking about its potential applications to energy-efficient computing, information storage, and light-based electornics. Other Contenders for this year's physics Nobel include research on Chaos theory, Dark Matter, Metamaterials (potential application: invisibility cloaks), the invention of the LED laser, and extrasolar planets. While they didn't make it into this post's synopses, look for more information on these awesome fields in the weeks to come! Excellent rundown of deserving candidate. One typo: There are two "t"s in Bennett. Oops! Fixed--thanks for the catch!